"Man made? Hmm, I don't think so!" 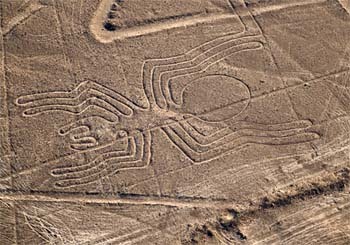 I have mentioned these before and today once again, we are looking at the Nazca Lines; a strange, little creepy and weird artwork in the Peruvian desert. They lay inside a plain between the Inca and Nazca valleys. Across this plain in an area measuring 37 miles long and 1 mile wide is an assortment of perfectly straight lines, many running parallel, others intersecting to form a grand geometric form. In and around the lines there are also trapezoidal zones, strange symbols and pictures of birds and beasts all etched on a giant scale that can only be seen from the air. The forms are so difficult to see from the ground that they were not discovered until the 1930's when a plane flew over the Nazca plateau and saw this gigantic art book. The figures include some 70 animals and plants include a spider, hummingbird, monkey, whale, some kind of being, and a 1000 foot long pelican. The spider just happens to be one of the rarest spiders in the world, so rare that it has only been found in remote and inaccessible parts of the Amazon. How did these primitive people travel so far from their homeland, crossing the formidable barrier of the Andes to catch a specimen? They even duplicated details of the spider’s anatomy, normally visible only under a microscope. The whale and monkey are also out of place in this desert environment. There are 900 forms on the plain. These include straight enormous lines, spirals, triangles, and circles. The longest straight line goes nine miles across the plain. How were they made? Somewhere, someone most likely has a perfectly logical explanation, whereabouts…unknown. How do you think these got there? I am going out on a limb and guessing aliens. Can you imagine having to design something you couldn't step back and look at afterward? Can you imagine the shock of that first airplane pilot to spot them? Aliens carved them from their spacecraft in the air -- maybe? Hi Siv - it's one of life's mysteries .. though I'm sure the sea level had something to do with the creatures - i.e. they'd have seen them somewhere ... the earth plates have moved so much, earthquakes happen etc .. but the Nazca lines are a fascinating phenomena ... and like us all - I'd love to know the answer ..